The 2011 Yamaha V-Star 1100 Classic is one of Canada’s best cruiser values. It features an authentic air-cooled V-twin, shaft drive and styling that is sure to stay true to the Classic name. Its authentic air-cooled V-twin pumps out some serious horsepower and performance, while its long and low design provides great looks and a low seat height. 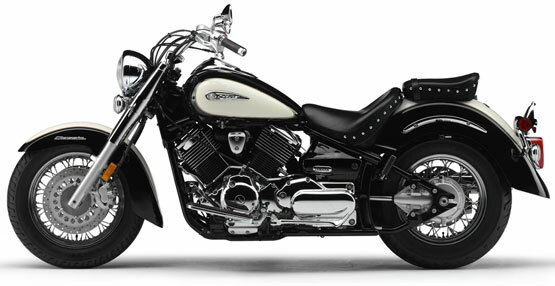 2011 is the last hurrah for one of Canada’s most popular motorcycles… hurry before they are gone. Lightweight forged pistons provide excellent durability while reducing reciprocating mass for fast throttle response. Dual Mikuni BSR 37mm carburetors with throttle position sensors (T.P.S.) feature carburetor heaters and handy, side-mounted air filter to ensure great throttle response and optimum power throughout the rev range. Smooth-shifting, 5-speed transmission is well suited to both city and highway use. 5th gear is an overdrive gear for reduced engine rpms at highway speeds for a smooth comfortable ride. Low-maintenance, chrome, exposed shaft drive delivers superior reliability and a clean, quiet ride. No chain to adjust or lube! Long, 1,645mm (64.8″) wheelbase means a long and low retro profile, with spacious ergonomics for added rider comfort and solid, stable handling. Beefy, 41mm front fork with 140mm (5.5″) of wheel travel smoothes out the bumps for excellent ride quality. Fork shrouds, top triple clamp, and one-piece handlebar holder are chromed for a quality appearance. Thickly padded, low-profile rider seat and passenger pillion offer excellent comfort. Passenger seat is removable. Deeply valanced steel front and rear fenders are durable, unmistakably classic and easy to customize or paint.